These days, it seems like there’s an automotive body shop almost everywhere you look. Every few miles, you’ll see one. Almost as frequently as you might see a McDonald’s restaurant. Which is why the choice becomes more difficult and even somewhat overwhelming when it comes to choosing where to take your car for the services it needs. Here at New Rochelle Toyota, we employ a team of certified technicians who can perform numerous services on your vehicle. Whether you need regular maintenance like an oil change, tire rotation, wheel alignment or air filter replacement or perhaps a more comprehensive installation or repair on your car, you can rely on our professional team to get the job done right the first time and get you back to your life as efficiently and quickly as possible. From Toyota, Nissan and Honda to Ford, Jeep, Subaru and Chevrolet, our teams have the training necessary to perform the services your sedan, SUV or truck needs to run the way it’s supposed to. We also equip your vehicle with genuine automotive parts and accessories that are meant to fit within your vehicle and belong alongside other internal components. This ensures optimal function, as parts from manufacturers are specifically designed to work fluidly together. 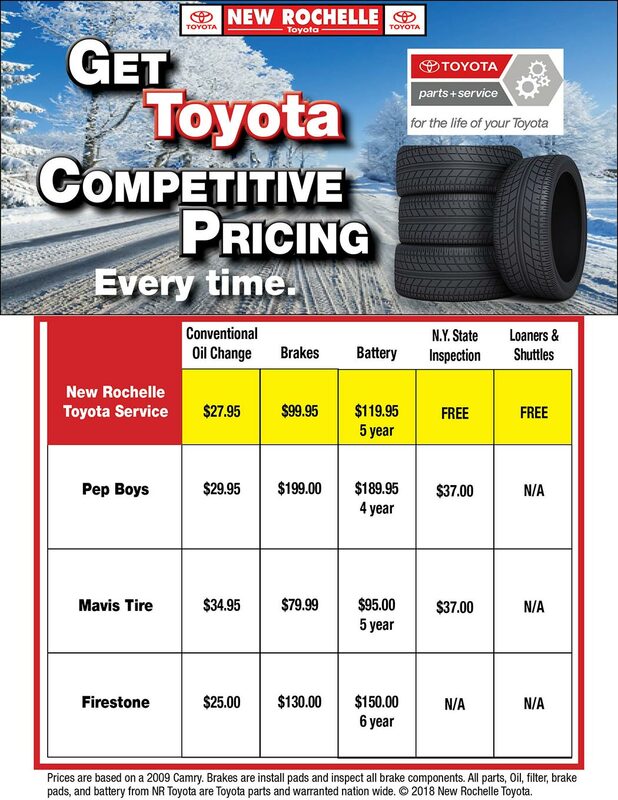 Making the decision on where to get your vehicle serviced can be tricky, but here at New Rochelle Toyota, we’re making it easy for you. Feel free to check out the chart we’ve provided down below to see some price comparisons of local body shops. When you feel ready to visit our new and used dealership for your service needs, feel free to schedule your service and also check out our service specials for any that you may be able to apply before you head over from Bronx, NY!